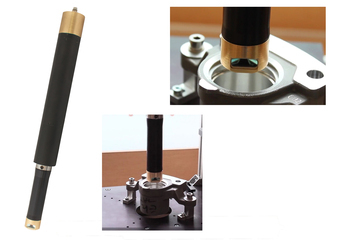 The RF096-Insp was developed after attempts to use a machine vision system for inspecting debris in a customer’s brake cylinder components had returned poor results. Whilst the application was specific to the component, the inspection system and its unique principle has a high problem solving potential for automated inspection of similar components where debris detection and removal is critical. The cylindrical housing of the RF096-Insp supports a binocular semiconductor laser sensor mounted on a rotating module. With the beam deflected at right angles and focused on the inner surface of the hole, the device is moved axially to scan and detect irregularities in the machined grooves using the triangulation principle. The integral signal processor analyses the surface profile and detects the presence of debris on the surface by comparing input and output signal profiles. The RF096-Insp is optionally supplied with a PC based service program that enables testing and parameter setting and display with FLASH-memory storage. RIFTEK also designs and manufactures a comprehensive range of optoelectronic 2D and 3D measurement devices and systems for high precision inspection and test applications across industry and research.